SKIL, known for their circular saws, has come out with a new saw unlike any other. 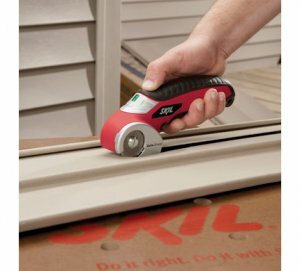 Introducing the SKIL Power Cutter; a cordless 3.6volt lithium ion powered cutter that provides an easy way to make precision cuts through hundreds of materials. From manly man to girly girls, this tool is made for them all. The Power Cutter features a circular rotating blade that allows it to cut through materials up to ¼" think, and an auto sharp system that keeps it sharp while you work. The 3.6volt battery holds a charge for 18 months, so even if you only use it once a month, you never have to worry about a dead tool. The Power Cutter cuts through everything from carpet, plastic packaging, fabric, leather, paper, cardboard, vinyl flooring, wallpaper and more. Check out the boys at ToolSnob.com for a full SKIL Power Cutter review.